Interview With Brenden Dillon! | Not Your Average Hockey Blog. Without further to do, here is our interview with Brenden Dillon! Per usual, we are in bold. So many of our readers might not know you very well, so tell us about yourself? 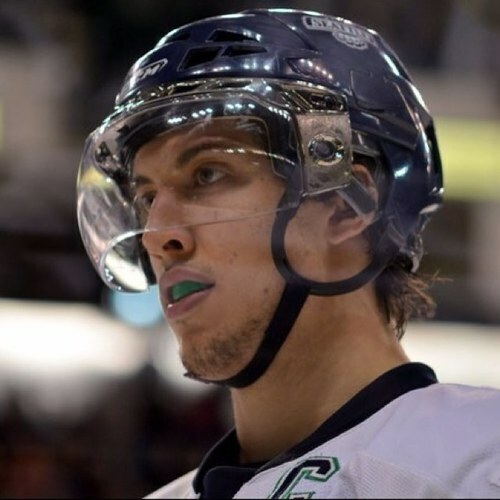 My name is Brenden Dillon im a 6’3 228 pound Defenseman from Surrey, British Columbia, Canada. I Started playing hockey when I was three years old. I played minor hockey in my hometown for 15 years then one year in Hope Jr. B for the Icebreakers followed by four years in Seattle for the Thunderbirds of the WHL. After my final season, I signed a 3 year contract with the Dallas Stars of the NHL. What kind of defenseman do you consider yourself? I like to consider myself a 2-way defenseman. I play a hard to play against, physical, gritty game defensively as well as use my skating and puck moving to help offensively. What’s a day in the life of Brenden Dillon? Well during the season, not too much exciting goes on, my days are pretty routine. If its a practice day I am up usually around 8:00 – 8:30AM. I get some breakfast in me and then at the rink for a 10 o’clock practice. Post-practice most of the time a bunch of the guys will grab some lunch together and then I will head home to nap, or get together and hangout with some of the other guys on the team. I bought a guitar this year as well as an Xbox to help fill some time as well haha. Most players I interview played in the NCAA, what’s it like playing in the WHL? The Western Hockey League was one of the best experiences in hockey and in life I was ever lucky enough to be apart of. Just like anything there are pluses and minuses to both going NCAA or Major Junior. The WHL though, its a very competitive league where I learnt so much on and off the ice. Its filled with tons of top NHL prospects and the schedule is the closest thing you can get to a professional one with all the travel and amount of games. I was lucky enough to play for a great organization and city in Seattle who treated me very well. In comparison to the WHL, what’s the difference compared to the AHL? The American Hockey League just like any league you graduate to or move up to. Its definitely a step up. The guys are bigger, stronger,faster, and its a great league. Especially in a year like this, with the NHL Lockout where you’re playing against NHL calibre players every night. The game and travel schedule in the AHL is a lot like the AHL, which definitely helped with my transition. What was it like getting signed? It was definitely an unbelievable feeling once I got signed… A major stepping stone towards my ultimate goal of playing in the NHL. What was going through your mind when you played your first NHL game? Haha its pretty tough to put into words that’s for sure. It sounds cliche but it was a dream come true. All the days you had the early morning practices dad had to roll you out of bed for, the long workouts, summer camps all worked up to that game. And at the end of it, it only made me want to be a full time NHL hockey player that much more. What’s the off season like? Offseason is definitely a nice chance to relax and unwind head back home and see friends and family. After a long grinding season my body needs a rest but at the same time once training starts up it gets pretty busy. Between being in the gym and on the ice it doesn’t always seem like an “off season”. What has been the highest point of your career? The highest point of my career to date has definitely been me signing with the Dallas Stars as well as playing in my first game for them. Lowest point? How did you persevere from that? I’d have to say my lowest point was after my second season in the WHL when I wasn’t taken in the NHL draft. You get your hopes up so high as a player for things whether it be to make a certain team or get drafted in whatever it may be. It was a real eye opener for me and “wake up call” that things weren’t just gonna magically happen. So basically just worked on the things I needed to get better at and still do to this day cause nobody’s perfect. I have just about everything and anything on there; Rap Country Techno. I listen to it all. Enjoy learning new things currently learning how to play guitar so that’s been taking up some time, love watching movies and golfing! Any advice for aspiring hockey player? For any aspiring hockey player I would say just continue to work hard. Its a pretty common phrase but at the end of the day most often times it comes down to you and what you do to better yourself.. Nothing worth doing comes easy.